It is apparent that water availaibility is a strong driver of the recent surge of investments in agricultural land globally, and in general the investments occur in countries with significant ‘untapped’ water sources. Agricultural development that is equitable and locally appropriate is needed to improve local and national food secuirity now and into the future. Foriegn Direct Investment (FDI) is rapidly growing in response to a number of global drivers and incentives from the goverment of Ethiopia and could in principle bring benefit (improved technologies, innovation, increased productivity, market access, etc) to local populations. The preliminary findings of this study demonstrate that water use impacts of current FDI at the national, basin, and local scale are potentially non-trivial, so that the narrative of ‘economic water scarcity’ or abundant untapped water resources needs to be re-evaluated while water appropriation neds to be a strong consideration in FDI. Deborah Bossio, International Center for Tropical Agriculture, Nairobi, Kenya; Teklu Erkossa, International Water Management Institute, Addis Ababa, Ethiopia; Yihun Dile, Stockholm Environment Institute and Stockholm Resilience Center, Stockholm, Sweden; Matthew McCartney, International Water Management Institute, Addis Ababa, Ethiopia; Franziska Killiches, Stockholm Environment Institute, Stockholm, Sweden and Potsdam Institute for Climate Impact Research, Potsdam, Germany; and Holger Hoff, Stockholm Environment Institute, Stockholm, Sweden and Potsdam Institute for Climate Impact Research, Potsdam, Germany. Ethiopia is often highlighted as a country in which a lot of foreign land acquisition is occurring (e.g.Butler, 2010; Time Magazine, 2011; The Guardian, 2011a). Estimates of the extent of the land assigned for foreign direct investment (FDI) range from 600,000 ha (Cotula et al., 2009), 1.2 million ha (World Bank, 2010a), 2.9 million ha (Access Capital, 2010) and 3.6 million ha (Mousseau and Sosnoff, 2011). The extent to which these investments also constitute significant acquisitions of water is the subject of this paper. It is apparent that water availability is a strong driver of the recent surge of investments in agricultural land globally, and in general the investments occur in countries with significant 'untapped' water resources. Ethiopia is no exception. 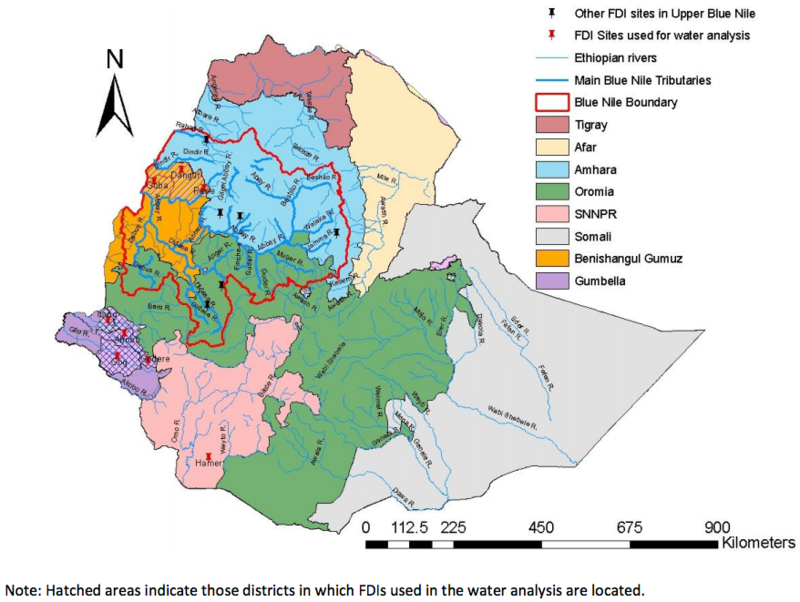 In this paper we focus on foreign direct investment (FDI) in Ethiopia and its implications in terms of water appropriation. To do so we 1) document existing agreements in selected districts, regions and at national level to paint a clearer picture of the FDI situation in Ethiopia, including how access to water is regulated; 2) estimate the potential water resource impacts of land use change associated with FDI for well-documented cases, using a crop model; and 3) extrapolate from these cases and compare resulting total water resource impacts with the water situation nationally and for the Blue Nile basin, as well as for two contrasting local case studies.